Summer has drawn to an end, which means it's harvest time! Last weekend, I decided to take down my garden, and got a reasonable harvest. For my first ever garden, it was a fun little experiment that resulted in dozens of eggplants, tomatoes, and peppers. So now, I've been looking for new recipes to make with the vegetables I grew from seed - tonight's dinner: Eggplant Parmesan! Nearly all the main components of this dish I grew myself, but I did have to rely on store bought items like breadcrumbs, tomato sauce, and parmesan cheese. To start, cut the eggplant into one and a half to two inch thick slices and let it dry for at least one hour. 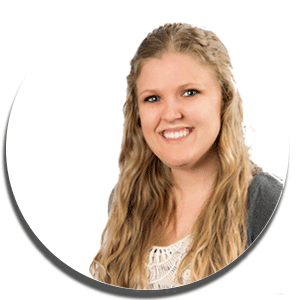 I placed mine between paper towels and placed a heavy plate on top to speed up the process. While the eggplant slices were drying, I made a quick sauce from my fresh picked cherry tomatoes, peppers, and parsley. I also added a generous amount of hot paprika, garlic and onions for an added burst of flavor. I've basically been in love with my food processor lately and have been making tons of different types of sauces, I even made my own pepper jelly (recipe coming soon!) and homemade pizza sauce (recipe coming soon!) with the remaining peppers and tomatoes from my garden. 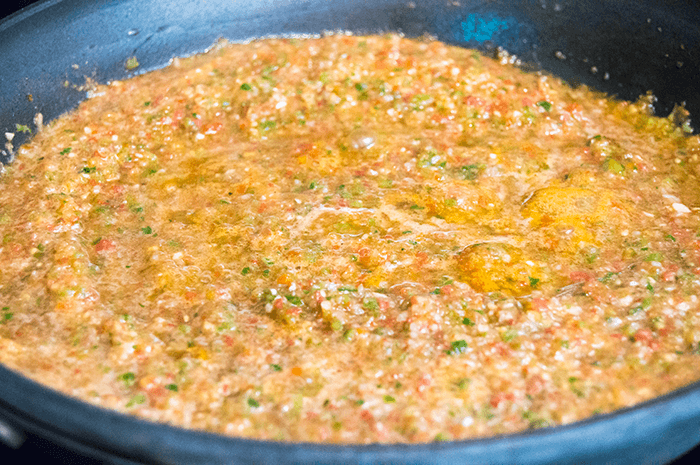 Simmer the pureed peppers and tomatoes until the liquid begins to separate and evaporate from the mixture. When the liquid has reduced, add the tomato sauce and stir until the sauce is smooth. I let my sauce simmer over a medium low heat while I prepared the eggplant. Just be sure to stir it every so often so it doesn't stick to the bottom of the pan and risk burning the sauce! Dip the eggplant slices into the whisked eggs and then cover with breading. 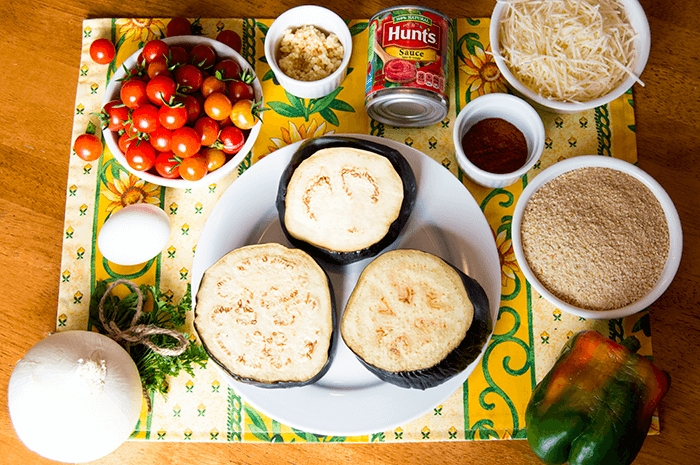 For thicker layers of breading, dip the eggplant back into the eggs and repeat! One issue I ran into with covering the eggplant with the breadcrumbs is actually getting the breading to stick to the eggplant skin. It's okay if the breading comes off while you fry the eggplant slices - it'll still taste the same. While frying the eggplant, taste the tomato sauce and adjust the seasoning as desired. Because I used cherry tomatoes, my sauce didn't need much sugar. You can tweak your sauce to your personal taste, but I definitely prefer my sauces a tad on the sweet side. Arrange the fried eggplants on a baking sheet and top each slice with tomato sauce and Parmesan cheese. 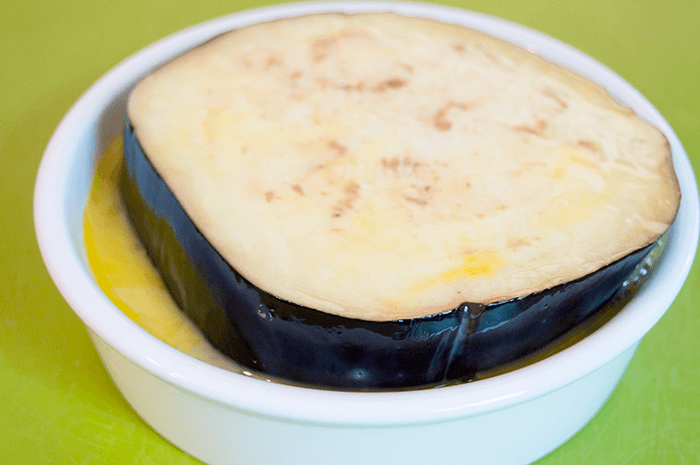 Bake the eggplants for fifteen to twenty minutes, or until the cheese has melted and the sauce has thickened. 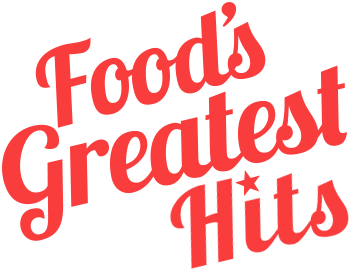 I served my eggplant parmigiana on a bed of fettuccine noodles, with more sauce to boost flavor. Eggplant Parmesan is one of my dad's favorite dishes - he practically begged me to bring him some once he saw I was making it, even though I live on the other side of our state. Luckily for him, I had enough leftovers to save him a slice, and then actually drove back to my hometown to give him some! I can attest this dish can be reheated within a week of making it, and will still be just as delicious! Cut the eggplants into slices about an inch and a half to two inches thick. Place the eggplants between paper towels and place a heavy plate on top. Let the eggplants release moisture for about one hour OR seal in a bag with paper towels and refrigerate with a heavy object on top over night. 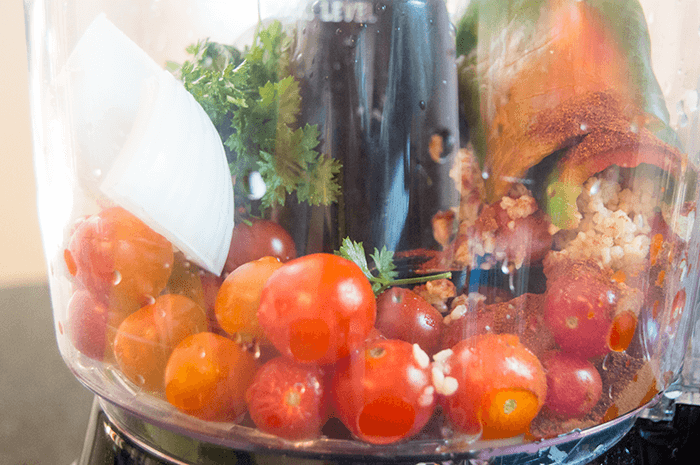 Preheat the oven to 375 F. Wash and prep the cherry tomatoes, and cut the pepper and onion into large chunks. 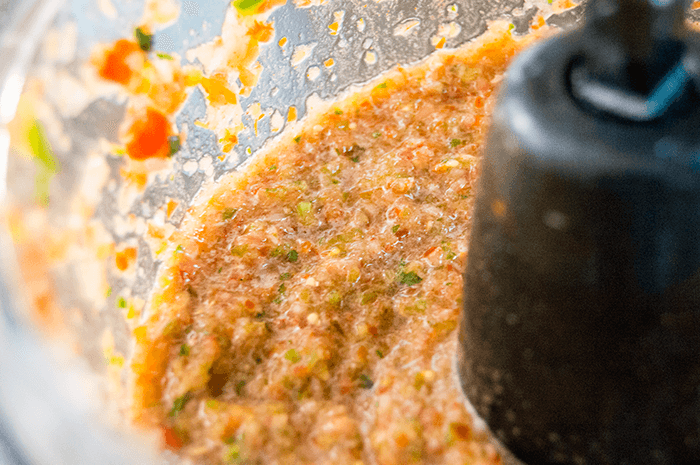 In a food processor, blend together the cherry tomatoes, onion, pepper, garlic, parsley and spicy paprika until a smooth sauce forms. Using a skillet over medium high heat, melt two tablespoons butter (or heat oil) until foaming. Add the pureed tomato mixture. Season with salt and pepper. 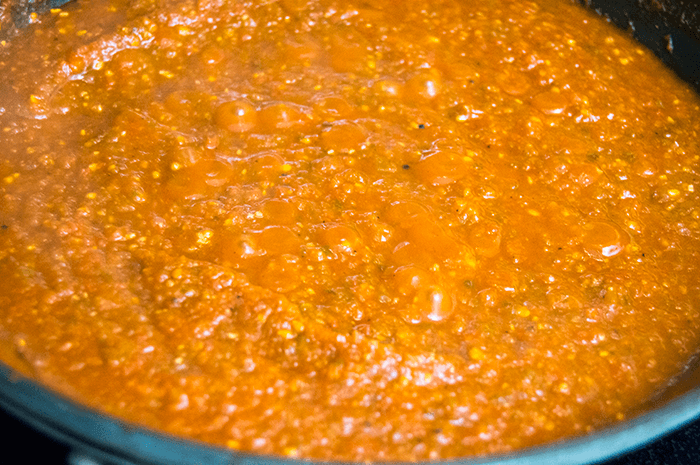 Heat until the sauce is separating the moisture from the ingredients and the volume has reduced by about half. Pour in the tomato sauce. Reduce heat to medium low and simmer while preparing the eggplants. Stir occasionally. Pour the breadcrumbs into a small bowl. Season with salt and pepper, as desired. Whisk the egg in a shallow bowl. Dip the eggplant into the egg and cover completely. Let any excess drip off. Dab the eggplants into the breadcrumbs until completely covered. 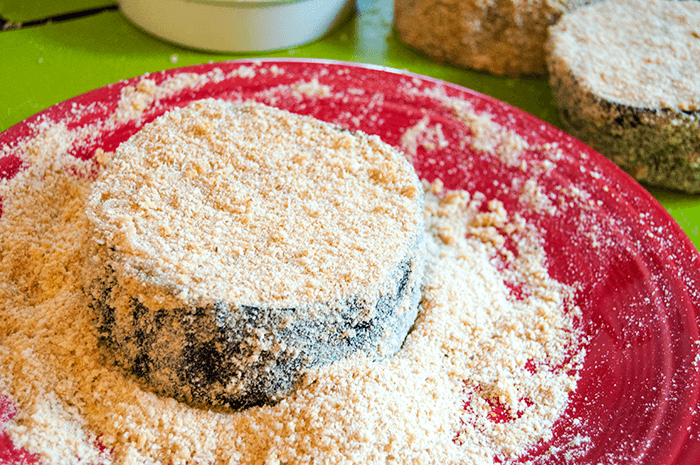 For a thicker crust, dip the eggplants back into the egg and into the breadcrumbs again until covered. Heat the remaining two tablespoons of butter (or oil) in a skillet over high heat until foaming. 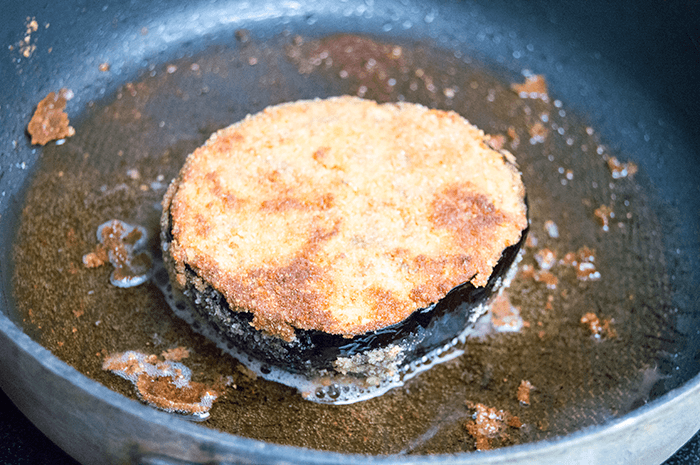 Fry the breaded eggplants on both sides until browned, about three to four minutes per side. 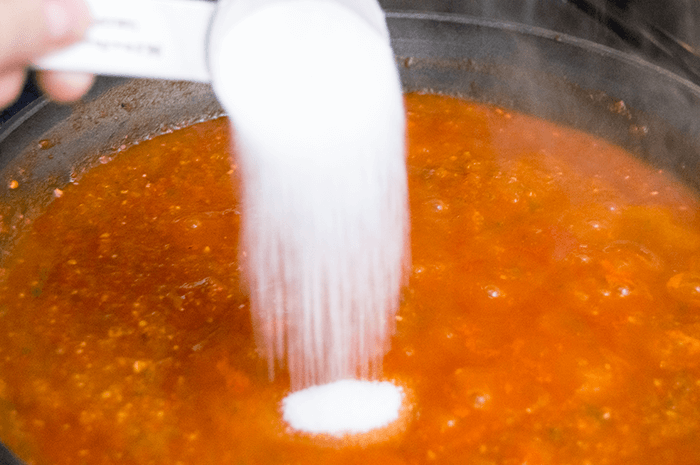 Add three tablespoons of sugar into the sauce on the stove. Stir well and remove from the heat. 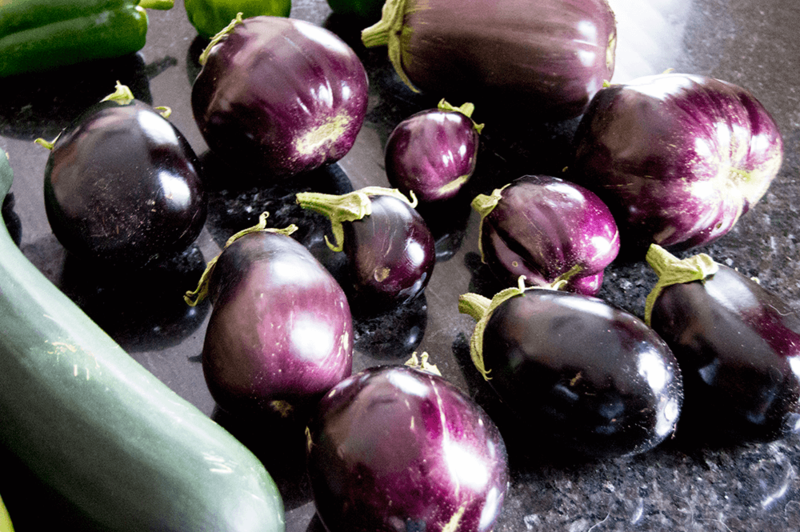 Arrange the eggplants onto a foil lined and greased baking sheet. Spoon a few tablespoons of the tomato sauce on top of the fried eggplants. Top the sauce with the shredded Parmesan cheese. Bottled any remaining sauce to use again. 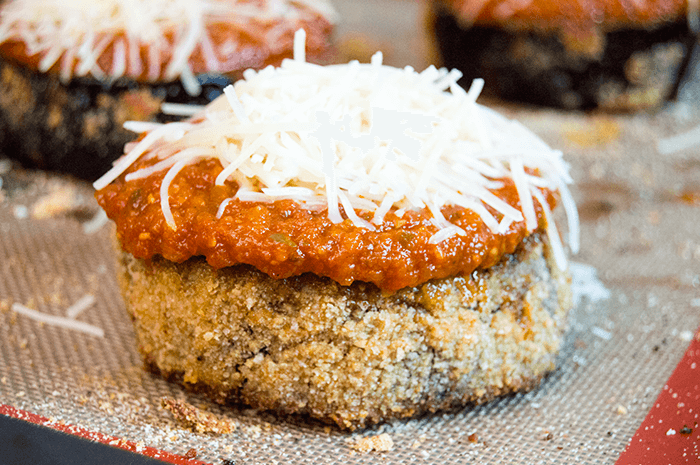 Bake the eggplant Parmesans in the oven for fifteen to twenty-five minutes, or until the cheese is melting and just turning golden brown. 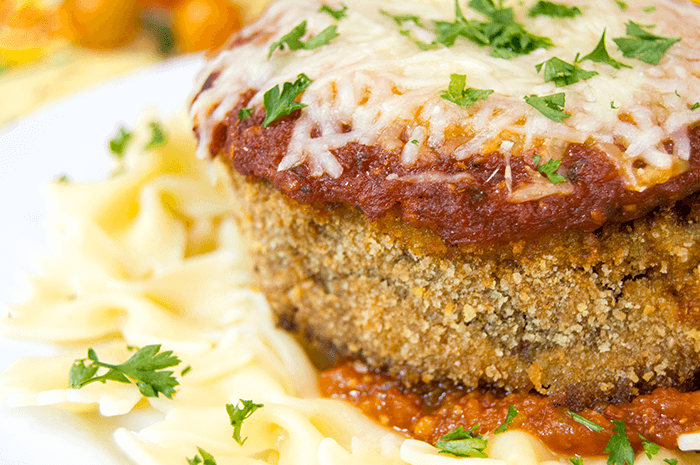 Serve the eggplant Parmesans on a bed of fettuccine noodles, as desired. Serve hot, and enjoy!